Mr. Sumant Sinha, Chairman & Managing Director of ReNew Power Limited, India's largest renewable energy IPP in terms of total energy generation capacity*, has been honoured with the prestigious Distinguished Alumnus Award -2018, by the Indian Institute of Technology, Delhi. 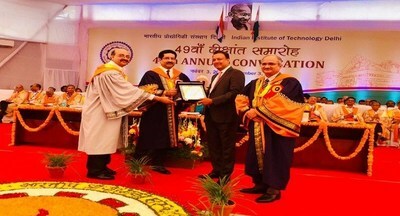 The award was handed over to Mr. Sinha during the 49th Annual Convocation of the institute at New Delhi on the 3rd of November, 2018, by industrialist Mr. Kumar Mangalam Birla and Prof. V. Ramgopal Rao - Director, IIT Delhi. Speaking on this recognition, Mr. Sumant Sinha said, "I'm honoured to receive this award from my alma mater. This means a lot to me and I will be happy to contribute in any small way towards the Institute's advancement. My experience at the Institute equipped me with the skills to engage with the best of minds across the globe and ultimately embark on a successful entrepreneurial journey." ReNew Power Limited is India's largest renewable energy IPP (Independent Power Producer) in terms of total energy generation capacity*. As of May 8, 2018, ReNew had a total capacity of over 5.85 GW of wind and solar power assets across the country, comprising 3.92 GW of operational capacity, 1.66 GW of under development capacity, and 0.27 GW of recently awarded SECI project. It develops, builds, owns and operates utility scale wind and solar energy projects as well as distributed solar energy projects that generate energy for commercial and industrial customers. ReNew has a strong track record of organic and inorganic growth having nearly doubled its operational capacity in each of the last three Fiscal Years. ReNew's broad base of equity investors include Goldman Sachs, JERA, ADIA, CPPIB, GEF SACEF India, and ADB (subsequently exited). ReNew Power Limited is proposing, subject to the applicable statutory and regulatory requirements, receipt of requisite approvals, market conditions and other considerations, to undertake an initial public offering of its Equity Shares and has filed the DRHP with SEBI on May 8, 2018. The DRHP will be available on the websites of SEBI at www.sebi.gov.in, BSE at www.bseindia.com, NSE atwww.nseindia.com and GCBRLMs, i.e. at www.investmentbank.kotak.com ; www.mlindia.com ; www.goldmansachs.com ; www.jmfl.com ; www.jpmipl.com and BRLMs, i.e. at www.idfcbank.com; www.ubs.com/indianoffers and www.yesinvest.in, respectively. Any potential investors should note that investment in equity shares involves a high degree of risk and for details relating to the same, please refer to the DRHP, including the section "Risk Factors" on Page 23 of the DRHP. Potential investors should not rely on the DRHP filed with SEBI for making any investment decision. "CRISIL Research, a division of CRISIL Limited (CRISIL) has taken due care and caution in preparing this report (Report) based on the Information obtained by CRISIL from sources which it considers reliable (Data). However, CRISIL does not guarantee the accuracy, adequacy or completeness of the Data / Report and is not responsible for any errors or omissions or for the results obtained from the use of Data / Report. This Report is not a recommendation to invest / disinvest in any entity covered in the Report and no part of this Report should be construed as an expert advice or investment advice or any form of investment banking within the meaning of any law or regulation. CRISIL especially states that it has no liability whatsoever to the subscribers / users / transmitters/ distributors of this Report. Without limiting the generality of the foregoing, nothing in the Report is to be construed as CRISIL providing or intending to provide any services in jurisdictions where CRISIL does not have the necessary permission and/or registration to carry out its business activities in this regard. ReNew Power Limited will be responsible for ensuring compliances and consequences of non-compliances for use of the Report or part thereof outside India. CRISIL Research operates independently of, and does not have access to information obtained by CRISIL's Ratings Division / CRISIL Risk and Infrastructure Solutions Ltd (CRIS), which may, in their regular operations, obtain information of a confidential nature. The views expressed in this Report are that of CRISIL Research and not of CRISIL's Ratings Division / CRIS. No part of this Report may be published/reproduced in any form without CRISIL's prior written approval."